Robinson and other musical radicals of that era were interested in portraying a revolution-friendly Rail Splitter. For that task he turned to Millard Lampell (of the Almanac Singers and the Weavers), who came up with a libretto based on the last chapter of Carl Sandburg’s biography of Lincoln. Burl Ives recorded The Lonesome Train in 1944; others who have starred in it through the years include Raymond Massey and Sam Waterston. 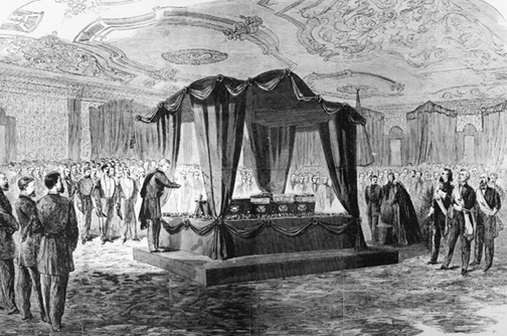 It depicts a spectral President Lincoln, passing among humble denizens of towns and cities across the United States, and speaking to his mourners personally. Well I’ll tell you ma’am, it seems to me the strongest bond of human sympathy, outside your family of course, should be the one uniting all working people of all nations, tongues and kindreds. It’s telling to restore the words to their context. Nor should this lead to a war upon property, or the owners of property. Property is the fruit of labor—property is desirable—is a positive good in the world. In other words, it’s more John Locke than Karl Marx. Lincoln held that one’s labor is itself a form of private property—that diligent labor leading to the accumulation of property is an essential of a free society. American communists celebrated Lincoln for ending slavery even as they shunned the reasoning at the heart of his anti-slavery view. The counter-subversives went after Earl Robinson. In fact, anticommunists protested the use of a recording of The Lonesome Train in suburban New York schools. Responding to my Lead Belly post, the highly alert James O’Gara brought up Joni Mitchell’s The Boho Dance. I hadn’t known of this song, or that Mitchell had weighed in on the perennial folk-music debate about authenticity—thanks James! The songwriters and musicians of her world, and going back at least to the 1930s, were at pains to show their solidarity with “the woikas” (as my friend Bob Cohen has taught me to pronounce it). They identified with the oppressed, which leaves them vulnerable to the charge of not really being the oppressed but just posing. Was it Neil Young? Tempting to guess, but it’s probably a composite of her intentionally dilapidated-looking friends. In any case, what better way to sum up the political Left’s well-known ambivalence toward success and individual distinction. “It’s an old romance, the Boho dance; it hasn’t gone to sleep,” writes Joni Mitchell. And it hasn’t since she wrote that song, which was in 1975. There’s a new documentary about the blues and folk genius Huddie Ledbetter (1888-1949) on the Smithsonian Channel. Legend of Lead Belly follows the career of the 12-string guitar wonder who absorbed the music of rural and small-town America in his travels through his native Louisiana and Texas. The writer and arranger who gave us Goodnight Irene, Midnight Special, Rock Island Line, and In Them Old Cotton Fields Back Home was famously “discovered” while serving time in Alabama by the musicologist John Lomax and his son, Alan. They brought Lead Belly to New York. Lead Belly, when he emerged from prison in the Thirties, was already an anachronism in terms of African American music. And so the only real audience for Lead Belly was white audiences. Of a certain kind, that is. Lead Belly was taken up by “some of the most prolific musical radicals of the day.” He “found an audience with the leftist community,” in the delicate phrasing of Kevin Strait of the Smithsonian. This sojourn among the Red folkies was faute de mieux. It included hootenannies in the Ledbetter apartment in midtown Manhattan, where the host always played and sang in a suit, bow tie, and carefully placed handkerchief—the crisp attire of the self-made man. Meanwhile Alan Lomax, Woody Guthrie, Pete Seeger, and the rest would show up in work shirts and jeans, which they wore because they were “trying to represent the common man,” says the musician’s grand nephew, Alvin Singh. 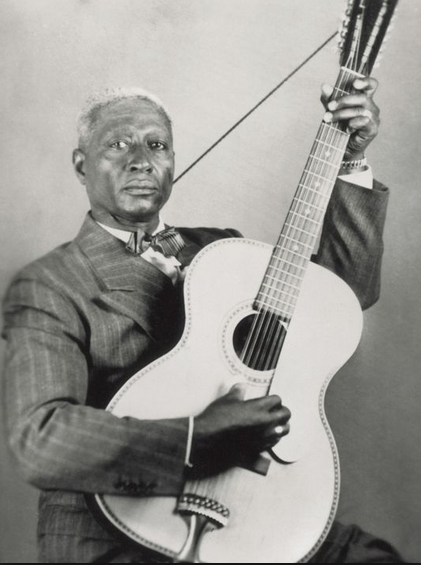 One of the players at the gatherings, Tom Paley, says Lead Belly was friendly in “a slightly formal way.” Eventually the dapper host, prompted by his long-suffering wife and her sister, would hint to his guests that it was time to wrap it up. Traveling to Los Angeles recently, I saw one young woman wearing a Che Guevara shirt and another clutching a handbag decorated with Mao’s face. The high-end toy and gizmos store near my office sells an expensive statue of Joseph Stalin; maybe it’s ironic in intent, but still. In other words, Marxism may have gone down to defeat in history, but as an ideal, as a cultural referent, as something regarded as positive and good and hip, it lives on. —Brian C. Anderson, from his review of Dan Mahoney’s book, The Other Solzhenitsyn: Telling the Truth About a Misunderstood Writer and Thinker in the latest issue of The New Criterion. The phrase “retro commie chic” was likely coined by Glenn Collins of the New York Times. Collins’ article about Greenwich Village’s K.G.B. Bar appeared in 1998; in the years since, the place has become a literary hub. According to a dining guide put out by New York magazine, “Today, the red menace congregates here—if graduate-level Marxist theoreticians can be considered ‘reds,’ that is.” The bar offers 40 kinds of vodka. Nazi stylishness, with 40 kinds of schnapps, would be an abomination to everyone. Nostalgia for left-totalitarianism (or at least the look of it) on the other hand exerts a lurid kind of attraction. Why? The Cold War’s length, and its having ended rather anticlimactically, have to be part of the reason. At any rate, what Fredric Jameson called “old-fashioned political art of the socialist realist type” captivated the production designers and graphic artists of 2014. The Interview. Communi st regimes still exist; as vestiges of an earlier time, they become candidates for camp. Former NBA star Dennis Rodman’s cultivation of North Korea’s dictator was no doubt the germ of this film. It’s too long and James Franco can’t do comedy. But yes, we have to stand by it given Kim Jong Un’s actions. 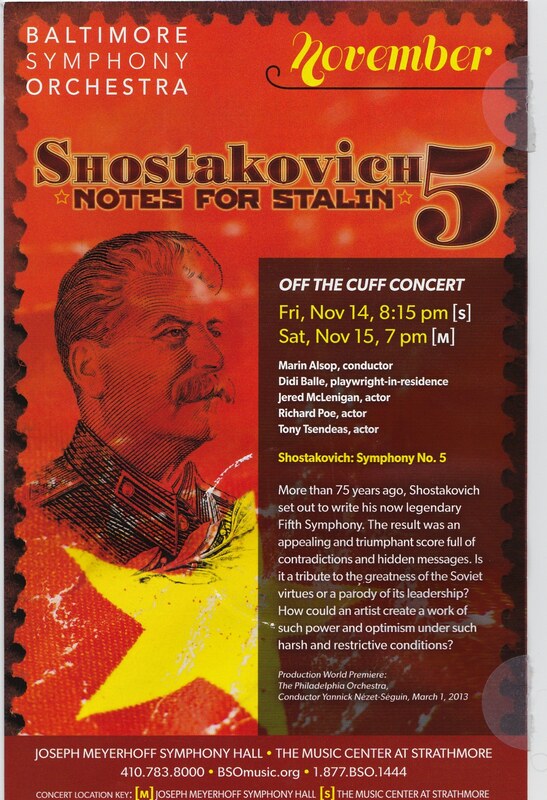 Baltimore Symphony Orchestra handbill. Last month, the BSO wanted to draw the public to Didi Balle’s “symphonic play” about Dmitri Shostakovich and his effort to survive the Stalin regime, while also opposing it. Since the piece is anticommunist, the use of a smiling Uncle Joe as, literally, a poster boy is confusing to say the least. Imagine promoting a night of music by the composer Wilhelm Furtwängler (whose ambiguous relationship with the Third Reich is somewhat comparable) with advertising that had one of those kindly-Adolf-Hitler-petting-a-dog photos. A funny thing happened on the way to the Gulag. 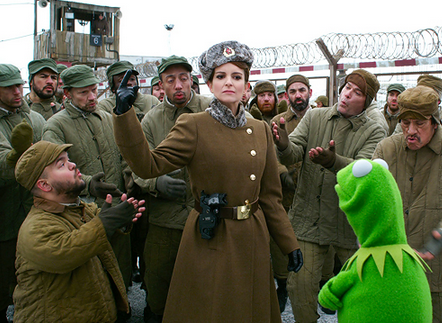 Tina Fey and some movie zeks, in Muppets Most Wanted. The Fast-Talking Howard Fast. This month’s guest essay is on the historical novelist Howard Fast (Citizen Tom Paine, Conceived in Liberty, Spartacus). It is graciously provided to Painting the Culture Red by historian Ron Capshaw. You can find it under Pages (top left). Two in a row. Airing on TCM right after the Dore Schary movie was a 1937 comedy with Carol Lombard, Fred MacMurray, and Dorothy Lamour called Swing High, Swing Low. “Music by Boris Morros,” it said in the credits. My bleary eyes opened and I perked up. Here was another Painting the Culture Red connection. The man who arranged Fred MacMurray’s pretend trumpet solos (jazz soundtrack pretty good, though there was too much of the wah-wah-wah of the trumpet mute) was also a Soviet intelligence asset who later became an American intelligence asset. 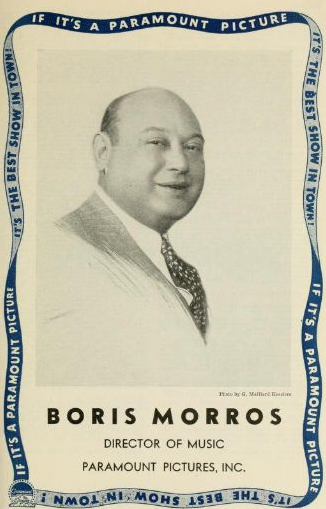 A pianist born in St. Petersburg in 1895, Boris Morros came to the United States at the age of 27 and worked for Paramount Pictures as a producer and head of its music department. His musical credits include Stagecoach and Hotel Imperial, and his producing credits include the Laurel and Hardy movie The Flying Deuces. For his part, Morros said that his motive in engaging in these activities was to ensure that care packages he sent to his family back in the Soviet Union got delivered. His colorful memoir, My Ten Years As a Counterspy, came out in 1959, and was adapted into a film called Man on a String the following year. He was portrayed on screen by Ernest Borgnine. The memoirist Morros is caustically entertaining if also utterly self-serving. 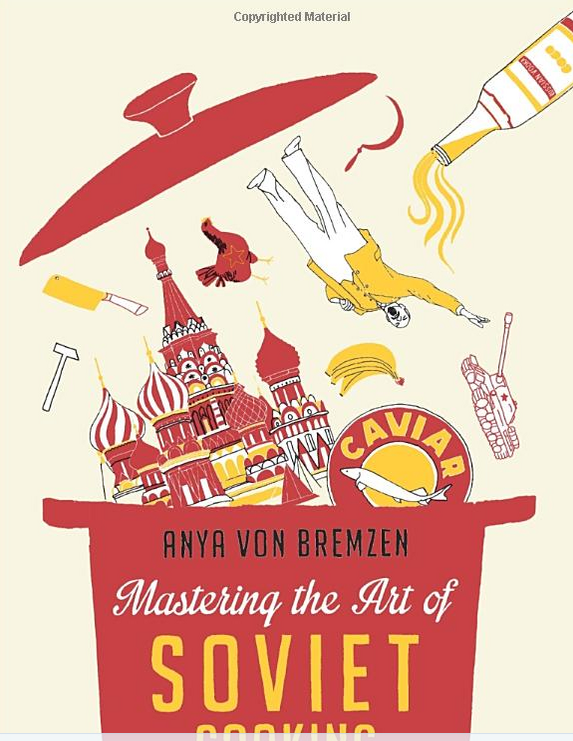 He describes the KGB agents of his acquaintance as moochers off the wealth of the Kremlin. He says they padded their expense accounts and pressed him for funds to bail out their unworkable business ventures. After 1944, the above-mentioned Zubilin was no longer Morros’s KGB handler. That honor went to a hapless-seeming man named Jack Soble. In 1949, after an employee of the U.S. Department of Justice had gotten arrested on a Manhattan street with her Soviet handler, Soble began to worry that his spy network, too, would be found out. He kept going back to the subject again and again, analyzing what had gone wrong and why. And he never stopped pounding away at me on the need for safety, safety, safety. He was warning the man who was happily turning in all he said and did to the FBI!